Joe Raso, recognized as one of the leading coaches and international scouts in Canadian basketball history, was named Director, Basketball Operations by the Canadian Elite Basketball League on Tuesday. He will lead the league's player procurement program both domestically and internationally, oversee the CEBL Draft, direct team and player compliance issues, supervise officiating, and play a lead role in the CEBL's relationships with FIBA, Canada Basketball, other basketball bodies, and with player agents. A resident of Hamilton, Ontario, Raso is the all-time winningest coach in McMaster University history, and one of the most successful coaches in CIS/U SPORTS history, compiling 389 wins against only 155 losses (a .715 winning percentage) in 18 seasons, including 17 seasons with 20 or more wins with the Marauders. He currently serves as Head Scout with the Canadian Men's National team, and is an advance scout with the NBA's Atlanta Hawks, Brooklyn Nets, and Denver Nuggets. Last season Raso served as head coach and general manager of the Niagara River Lions, leading the team to its first-ever playoff victory before the franchise moved up from the NBL to join the CEBL. 'I am very happy to be on board with the CEBL, and joining a winning and dedicated professional league that is building a legacy for a game that means so much to me,' Raso said. 'The CEBL is going to be an entertaining league that allows Canadian fans nationally the opportunity to enjoy professional basketball that will include Canadian and international talent playing together in great facilities. The development of this league, with its solid corporate administration and commitment to entertainment and the development or basketball, is very important to me. Raso has been a national and international consultant, clinician, committee member, speaker, and basketball analyst during the past 25 years. A former National team assistant coach for four years, he has coached in World Championships and Olympic qualifiers, and has coached some of Canada's greatest players, including NBA two-time Most Valuable Player and Hall of Fame inductee Steve Nash. Raso's basketball resume includes four OUA titles, 12 CIS National Championship tournament appearances that resulted in four Silver medals, and being named OUA Coach of the Year six times. He produced five 'All Canadian' players and two National Player of the Year winners while leading McMaster. An alum of both McMaster and Brock universities who started his university coaching career at the University of Guelph in 1983, Raso has been instrumental in developing basketball at the grassroots level. He is a former Technical Directory with the World International Children's Games, and his Hamilton, Ontario teams won international Gold, Silver, and Bronze medals at those Games. As a high school teacher for 32 years, he coached St. Mary's high school in Hamilton to an OFSAA championship in 1991, and represented Canada at the Albert Schweitzer Tournament in Germany, the top international junior tournament in the world. He has served as director of the Joe Raso High School Basketball Camp since 1999, and as director of Focus on Youth Basketball Camp in Hamilton since 2009. Raso was founder and developer of 'Basketball vs Bullying', which became the largest anti-bullying seminar in the world and holds the Canadian record for the most attended university basketball game in Canada's history. He was awarded the YMCA National Peace Award in 2006 for that initiative. In 2008 he developed and co-directed 'Hoops Against Hate 'Faces of Racism'', an interactive experience for high school students using basketball to deliver a message of anti-racism. 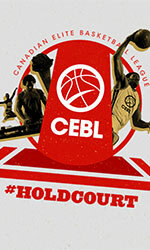 The inaugural season of the CEBL tips off in May 2019 and runs through August with teams in Hamilton, Niagara, Guelph, Saskatoon, Abbotsford, and Edmonton. Teams will play 20 regular season games, including 10 at home. Deposits on priority season tickets are being accepted now by each team, with season seats going on sale later this fall.